Here's another addition to the Alpinestars Stella line that once again proves Alpinestars doesn't skimp out on durability requirements, while still keeping comfort and quality features intact. The women-specific ergonomic design seems to denote a smaller, narrower cut -- a great choice for a snugger, more comfortable fit, and it's even available in size XS if needed. 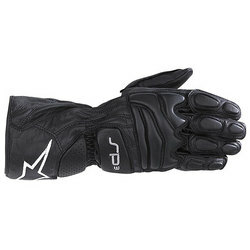 The gloves themselves are constructed from full-grain leather, with an added Kevlar reinforcement on the palm. The 5mm EVA knuckle protection is intended for extra softness and flexibility, with great stress-crack resistance and resistance to UV radiation. Other features include a padded finger-to-wrist protection segment, and an elastic wrist closure system for a no-fuss fit. Embroidered logos are in classic Alpinestars white, and the gloves main design can be ordered in black, red/white, or blue/white. Want an armored jacket to complete the look? You'll like this Diamond Armored Jacket from Teknic.